The Go2Nova® #8408 hand controller is one of the major version hand controllers of iOptron’s revolutionary GOTONOVA® computerized control system -- the latest in automated tracking technology and one of the best available on the market today. With its large database, even the most amateur stargazer the ability to search the skies with ease. Using the easy-to-use hand controller and its large 4-line LCD screen, you can easily set up the telescope mount and select where you want to go with the very friendly user-interface. The control system also allows you the user to slew the mount at 9 different drive speeds, keeping the object within the telescope’s viewfinder for as long as you wish. GOTONOVA® also makes alignment quick and simple. 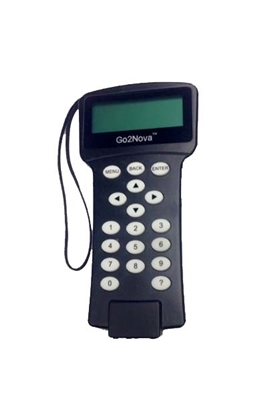 The Go2Nova® controller is much easier to use than other similar products. The hand controller is more intuitive with menu categories better organized. It also has a larger LCD screen with more lines of content (4-lines) compared with the competition. You can easily set up your telescope and select where you want to go. GOTONOVA® Computerized Control System The revolutionary GOTONOVA® computerized control system is by far the most technologically advanced automated tracking system available on the market today. With a database includes all of the most famous galaxies, nebulae, star clusters, not to mention the planets, you’ll be able to enjoy star gazing with the simple push of a button. The #8408 hand controller also includes a serial port for connection with a computer for firmware upgrade or use with planetarium software.